"Come and Try a Free session"
Collingwood City FC (CCFC) seeks to offer a modern player development program through high-level and up to date coaching techniques. Coaches at CCFC specialise in children and junior training programs and their focus and passion is the development of boys and girls at this age. The training style and focus differs to Senior’s and requires great patience and understanding of the needs of this age to ensure full benefits are derived while maintaining fun and enjoyment. The program introduces the basic fundamentals and builds on these as the players develop. At the end of each training the players are put into small teams and play in small sided games. The smaller fields, modified rules and fewer players mean a more enjoyable game with more opportunities to touch the ball and more opportunities to score goals, once again increasing the likelihood of an overall positive experience. The modified rules aim to promote inclusiveness, engagement and technical ability. 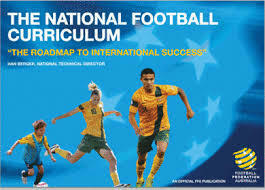 As your child progresses through the various age groups they will be introduced to playing environments that most suit their stage of development and prepare them for the transition to 11v11 football when the time comes. MiniRoos is a smaller version of football that provides boys and girls aged 4 - 11 with a fun introduction to the world game. MiniRoos is designed for kids; it is all about having fun, learning new skills and making life-long friends. Delivered by grassroots clubs across Australia, MiniRoos provides opportunities for boys and girls of all abilities, shapes and sizes to play football. Football is the game that everyone can play, so get involved and become a MiniRoo today! 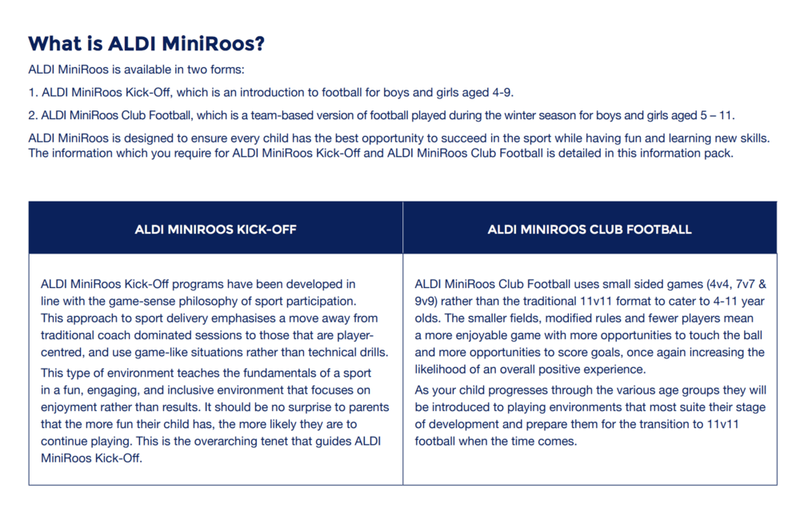 MiniRoos provides an enjoyable participation experience for young people of all abilities with a major focus on skill development through freedom of expression, minimal coaching, and limited emphasis on the scoreboard. MiniRoos is a modified version of the game designed to meet the needs of players aged 5 - 11. The smaller sized fields with fewer numbers of players per team encourages more touches on the ball and opportunities for more goals to be scored.